Villa Lyra is located on the hillside of the exclusive gated Domaine du Levant complex. It offers superb views, terraces, pool, spacious living room, al fresco dining, and well equipped kitchen. The bedrooms are of equal size and comfort with similar decor. The master bedroom is in the main building with a private terrace and ocean view. Two other bedrooms are in a private cottage located off the pool. All bedrooms have ensuite bathrooms and open to the view. The 4th bedroom is incorporated into a mini-suite with a kitchenette and living area, and it features its own terrace. These accommodations would be ideal for a nanny. A pleasant walk to Petit Cul de Sac Beach. 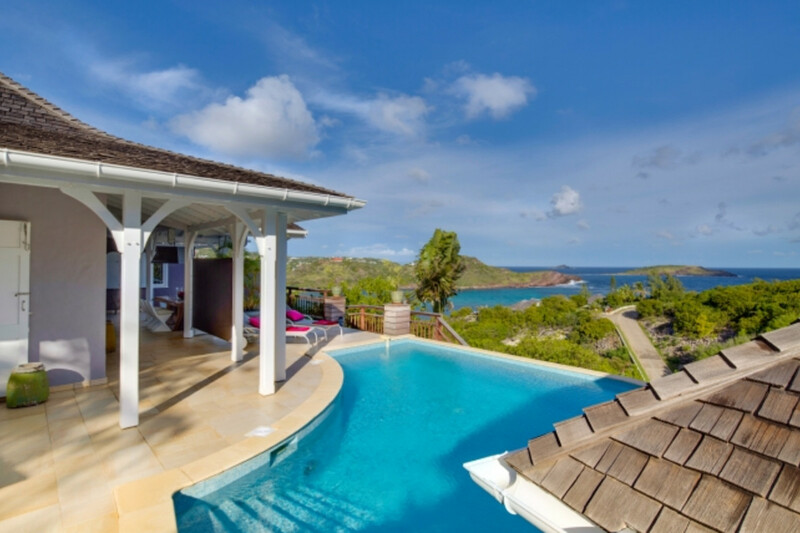 ###THE VIEW Breath-taking views of Petit Cul de Sac, Tortue Island and distant St Martin ###CHILDREN AND PETS Children allowed Small pets allowed ###DETAILS The Hillside villa has 4 bedrooms, 4 bathrooms. SERVICES Housekeeper every day except sunday and public holidays, pool maintenance, gardener, household linen, bath towels, beach towels.